Can blockchain and traceability provide more sustainable outcomes for diamond and gemstone supply chains? Blockchain technologies have come under considerable scrutiny in terms of the high energy requirements for their computing infrastructure and their cryptic uses. However, there is emerging consensus that blockchain can help to assure more sustainable supply chains particularly in the extractive industries. At the beginning of the 21sth century, the diamond industry and sovereign governments formed the Kimberley Process Certification Scheme (KPCS) in response to great pressure from NGOs, consumers, and others to stop “conflict diamonds” entering the diamond supply chain. Such diamonds were extracted and sold by illicit forces, and the funds from their sales contributed to conflicts in countries such as Angola, the Democratic Republic of Congo, Liberia, and Sierra Leone at the time. The KPCS sought to stop the inflow of these diamonds into the legitimate diamond supply chain by putting in place a ‘country of export’ certification program, although there have been calls for the KPCS to be expanded to cover human rights and other issues. Diamond is not the only mineral or metal used in jewellery supply chains that has been scrutinised in recent years: for example, there has been a focus on gold (Dirty Gold campaign in 2004 and Conflict Gold in 2012), rubies and jade from Myanmar (Tom Lantos Jade act introduced in 2008 and since removed) or lapis lazuli from Afghanistan (Global Witness, 2016), to name a few notable cases. In response to these developments, jewellery industry associations (e.g. CIBJO, WDC, ICA, AGTA) have begun to address these issues and companies have gone on to form a range of initiatives to strengthen responsible practices in the industry, such as the Responsible Jewellery Council (RJC). The Organisation for Economic Cooperation and Development (OECD) developed due diligence guidelines for responsible mineral supply chains for companies seeking to respect human rights and avoid contributing to conﬂict through their mineral sourcing decisions and practices; these guidelines now apply to all minerals, including diamonds and coloured gemstones. As in other sectors (e.g. food, fashion, shipping), there is now greater demand for specific information on how the raw materials leading to finished pieces of jewellery are extracted and processed. Traceability is one way to provide more transparency and specific information, and it is frequently argued that by increasing transparency, supply chain issues can be better mapped and understood and good governance can be enhanced, ultimately helping to improve the environmental and social impact of a supply chain. Blockchain and other traceability tools are being heralded as solutions to transform the jewellery industry and provide greatly needed transparency. But how can traceability contribute to more sustainable outcomes for diamond and gemstone supply chains? Consumers are increasingly interested in knowing where and how the gemstones and jewellery they purchase are mined and manufactured. Media and NGOs are placing the gem and jewellery industry under increased scrutiny regarding the origin and sustainability footprint of various gemstones and human rights issues in the artisanal mining sector. Some companies want to be proactive so as to mitigate risks and better understand their own supply chains and contribute to positive outcomes. 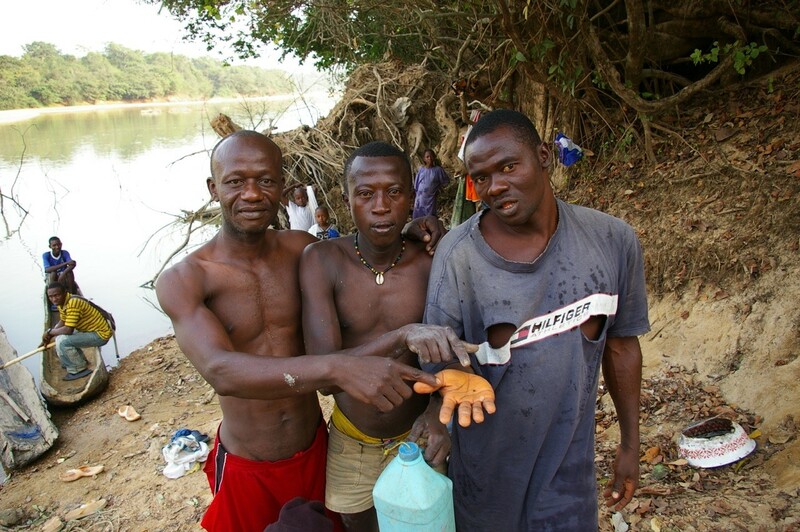 Governments want to improve the management and revenue collected from gem resources. Global governing bodies have highlighted issues such as smuggling and money laundering. Some governments (e.g. USA, EU) have instituted ‘conflict mineral’ legislation, requiring publicly traded companies to know and trace their supply chains and comply with their laws. As best practices standards within mining, processing and sale of gemstones are increasingly defined worldwide - the development of techniques to track and trace gemstones may support the accountability of such schemes. Tracking (from origin to market, or forward traceability) and tracing (from market to origin, or backward trace- ability) conceptualize the path of an item and how it can be identified within a supply chain. Whereas tracking and tracing describe path direction of goods, traceability is a more overarching term that is defined by ISO as “the ability to identify and trace the history, distribution, location, and application of products, parts, and materials”. Demand for both tracking and tracing within the gem industry is growing, as origin claims need to be verified. In addition, sustainability claims are increasingly being made about gems. In such cases, traceability is equally vital to uphold and validate such claims. Blockchain- a silver bullet for the industry? Figure 2: This generalised example of a blockchain serves to illustrate how information can be documented on a single gem’s journey from mining to cutting and onward to retail and eventually the end consumer. After the stone is mined, the trade and transfer of ownership are validated at each step by both parties involved and recorded immutably to the blockchain. Illustration by L. E. Cartier (Courtesy of Journal of Gemmology). There has been considerable hype around blockchain in recent times with radical promises made of how it could disrupt and transform entire industries. Blockchain is a decentralized and immutable ledger, which is the basis for the potentially huge transparency gain that this technology can offer. 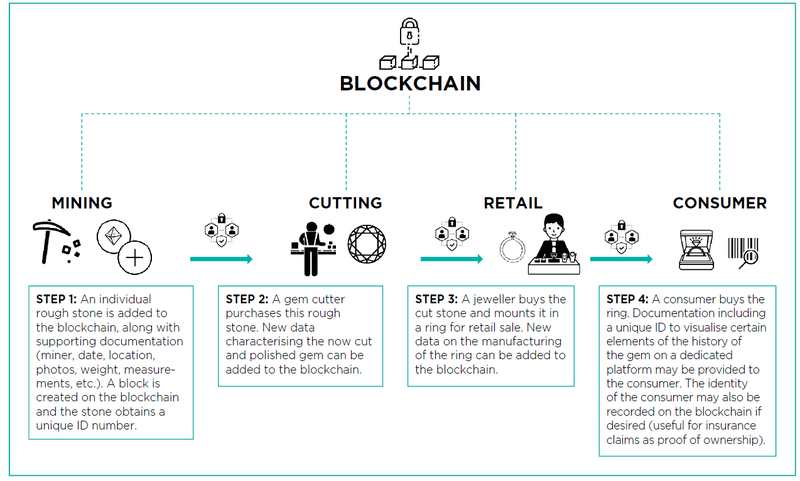 At each step, data added to the blockchain are verified, ownership is attributed, and the information is time stamped, encrypted, and stored permanently in a distributed and decentralized manner, providing an immutable record that is formed of a single, yet shared, source of information about a gemstone’s journey from source to end consumer. Blockchain can thus provide transparency and verification to the regulators and other users who require it, while still providing the privacy and the specific views into the ledger that are relevant for each different type of user. This is an important factor for the gem and jewellery industry, which demands verified, but often anonymized, chain-of-custody solutions. The prospect of combining blockchain with smart contracts (automatic trades and verification between accounts/users if pre-required conditions are met) can potentially provide a huge gain in efﬁciency (especially with regards to demonstrating compliance and know-your-customer procedures), and they are one of the main reasons why blockchain is being widely investigated as a game-changing technology. Diamond miner De Beers launched the Tracr blockchain in 2017 to track diamonds through the full value chain. The Trustchain Initiative (piloted by IBM) is an industry collaboration to pilot traceability using blockchain in diamond and gold jewellery from mine to retailer. Finally, Gübelin and Everledger are piloting a blockchain for coloured gemstones that is due to be launched in 2019. For the potential of traceability technology and blockchain to fulfil its promise, some important questions need to be further researched. The central premise being how the potential efficiency and transparency of blockchain can best be put to use in mineral supply chains. As blockchain is a nascent concept in other sectors too, it is unclear whether industry-wide consensus is possible or necessary at this stage. Fundamentally, for a gem and jewellery industry that consists largely of cottage and family-owned companies, further research is needed to understand how all levels of the supply chain (e.g. artisanal and small-scale miners and SMEs) can benefit from traceability opportunities that blockchain technology provides. Furthermore, before blockchain can be fully implemented in the gem and jewellery industry concerns such as the energy footprint of blockchain and possible privacy issues (e.g. related to GDPR – the General Data Protection Regulation EU law that covers data protection and privacy for all individuals) need to be taken into account. As in other industries, traceability technology can be disruptive but is in itself not enough. It has to be combined with chain-of-custody and auditable practices, and of course access to technology itself in order to be impactful. The focus should be on how traceability can help improve the jewellery industry’s sustainability footprint so that it can better contribute to the Sustainable Development Goals (SDGs) outlined by the United Nations. In summary, there is no ‘silver bullet‘ for traceability or improving practices in the diamond and gemstone supply chains. Ultimately, multiple approaches, initiatives and technologies are likely to spur greater transparency and provide more sustainable outcomes in the industry.